My favorited series highlights the restaurants, stalls, markets, and any other kinds of food purveyors that make the top of my list for the best of what they offer in this city. Bettolona is an Italian Restaurant that feels like home. It may not be the best restaurant in the city, but it is one of my favorites. A review of local newcomer, Bespoke Kitchen, creating custom plates in the West Village. Where do I start? This is gonna get emotional kids, so get ready. If you've read any of my posts or my website, then you'll probably know that I'm a Native New Yorker. Not only a Native New Yorker, thought, a Manhattanite. To me it's not unusual because it's the only life I've ever known, but others have called me a unicorn. I guess some people just have a hard time even believing that I really exist. But my fellow Natives get it. They get me (unless they're from the East Side, of course:-) ). The kids that I grew up with, those fellow Upper West Siders, and those who may have "lived" elsewhere, but adopted the UWS as their 2nd home, they truly know who I am and what makes me that way. We all shared a lot of the same insanities, challenges, and experiences. We've also all seen our neighborhood change drastically over the last 30 years with a few dependables that withstood the real estate storms (good and bad) and the big box invasions (mostly bad) and the increase in banks and nail salons to shut down places we literally grew up in. Places that weren't just a restaurant or a bar, but were home. They were mecca, they were our oases. We didn't have cars. We didn't have backyards or basements or attics...OK, sometimes we would sneak into those places, but there were all sorts of dangers when we did--mostly that we'd still be cold in the winter or hot in the summer and likely someone would find us and kick us out (and then tell our parents if not the police). What I'm saying is that while you may not understand how it is that I grew up in the city, I don't understand what your life was like in the burbs or whereever. What this all means is that we attach major emotions to our local watering holes or divey diners, that would host our late night bullshitting in their booths as we fill up on greasy fried food or underage boozing just to connect with one another. Because despite what you may think of NYers that's something we're damn good at, connecting at a real human level. With so many different characters, it just becomes second nature to be able to have a deep meaning conversation with a complete stranger, when you want to, or to completely ignore your neighbor, when you're just too damn tired. So, when you find a place where they know your face, if not your name and welcome you in for unlimited hours to contemplate the world with old friends and new, it becomes easy to call that place home. And next thing you know you're spending your nights and probably your days there. Big Nick's was one of those places. 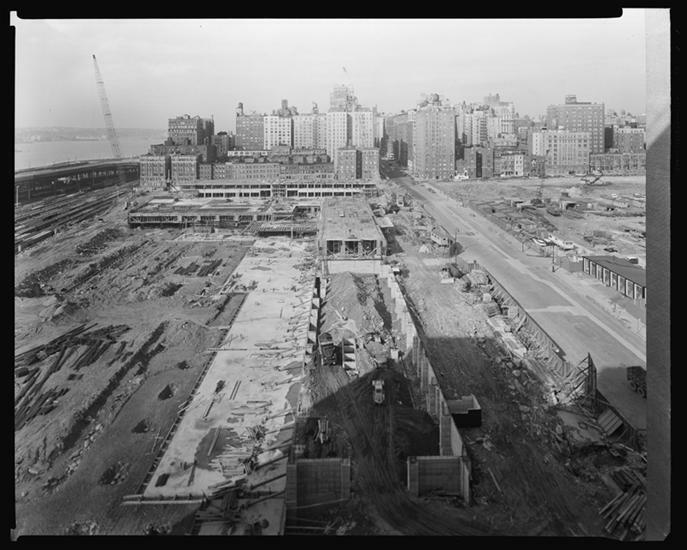 The history of the Upper West Side is sort of a Rags to Riches to Rags to Riches story. Compared to Manhattan neighborhoods below 59th street and even more so below 14th street, the UWS (as we call it), is a pretty young neighborhood. In the early 1800's there were some farms and villages, including the historic Seneca Village that was comprised mostly of freed black slaves who were displaced by the building of Central Park. Ah, the parks--another place that was home to those of us that grew up in the neighborhood. 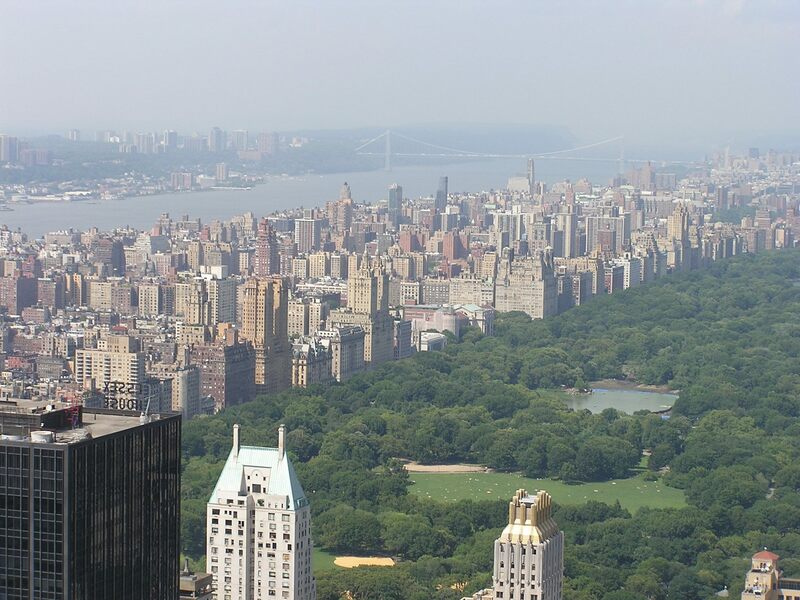 Central Park and Riverside Park make the Upper West Side, literally. As the neighborhood is actually defined by the reaches of Central Park (59th-110th Streets). The bordering parks opened in the mid-late 1800's setting the stage for luxury developments to come in along the beautiful vistas created by these landmarks. The rich were moving in. And,of course with the Ninth Avenue Elevated train (The El) bringing the working class into the area, tenements were built to accommodate another class of resident. And Broadway provided a main shopping thoroughfare for the lot of them. The difference between the East and West Sides is not just the old vs the new money (Early on German tycoons moved to the UES after a major tragedy in the East Village), but also the diversity in the crowd. The variety of housing and businesses on the UWS led not only business professionals, but creative types and educators and blue collar workers of all shapes, sizes and colors to move into the area. Things were going very well up until the depression hit. And it hit the UWS hard. People turned to drugs and so followed crime. Just another layer of the fabric that has made us what we are. Crime drives down real estate and more and more immigrants move in. The Upper West Side's ever-changing face continues and Mayor LaGuardia seeks to turn things around. So the place featured in West Side Story becomes slated for a huge arts complex, that we now know and love as Lincoln Center. This was all apart of a major urban renewal project started in the 1950's. And it worked. For the most part anyway. Dollars started flowing back into the Upper West Side, and the artists and political activists never left. Great schools were created, but a lot of the lower income residents still had issues with drugs and crime, so people were still hesitant to buy property through the 80's. Enter the parents of myself and the friends I grew up with. Some of whom still have super-rent controlled apartments, but then others had families who decided to buy on the UWS in the late 1970's early 1980's. My parents purchased a three bedroom apartment on West 70th Street in a pre-war co-op for under $200,000 in 1983. Which, to bring you up to speed, would probably go for close to a million dollars today, at least. 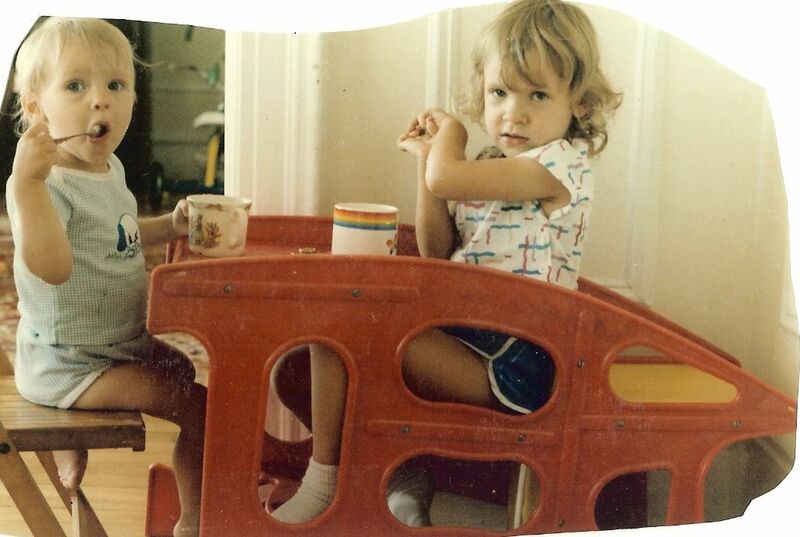 My sister was born shortly after we moved into the Santa Monica, and the two of us grew up in what is now one of the most sought after neighborhoods for young families and professionals who can afford it. 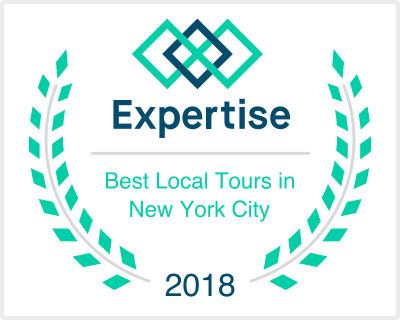 You're smack dab in the center of a great school district for both public and private educations, and you're surrounded by parks and artistic institutions as mentioned already. And in the last 5-10 years there have been a ton of great restaurants moving up to the area, making it quite the culinary hotspot (if you've got the $ to spare). We've even got some big box stores in the area--missing your hometown Cold Stone Creamery? Check it out on 72nd Street! They do all the things you'd expect from any other part of the country! Yeah you can stop by a Best Buy on your way to Lincoln Center, no problem it's right there! 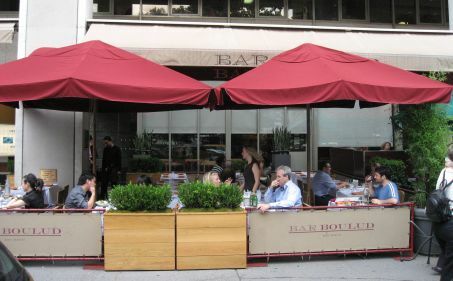 Or maybe just pop into Daniel Boulud's restaurant/cafe that's just across the street for a little nibble of high-end foodstuffs. But at the time we were growing up there it was still very diverse and very middle class. With huge housing projects starting across the street from our little old building and filling in the blocks through to Hell's Kitchen, affordable housing was aplenty, for a time. Going North there were tons of smaller buildings and brownstones that had been around for quite a while and many people managed to fall into the rent-control goldmine as they stuck through the bad times and the good. It truly was a small community. There are people who have lived in the area since I was a child and when I see them today they still recognize me and I them, because we shared our home. Things that most people think cityfolk lack, we had. Because we were surrounded by small businesses. They weren't just businesses, they were people, and they were safe havens, they were comforting for parents of children in such a big city. We knew if we walked up the block to the pharmacy, they'd know us--as kids that was our local candy store. The owners at the Italian restaurant would greet us as we'd dine in regularly to get our fixes of our favorite foods (mine was fettuccine alfredo and I rarely had to even order it). We went to school with the kids of the cashiers at our A&P, and often my mom would end up holding up the line as she'd gossip with her friends. Woolworth's provided a place for us to try out all of our hobbies and interests, from knitting to sticker collecting to hamster owning, and the staff knew to be on high alert when we walked into the store, as we also tried our hands at petty-theft there before getting caught at The Paper House a few blocks north. We saw Pathmark turn into Rite Aid, turn into Duane Reade and then into a financial institution (before the epic Walgreens takeover). When I got caught doing bad things in High School, my friend was able to escape to our local bagel shop, where every single employee in there knew us by name--and although they weren't necessarily the wisest when it came to minor care, we knew that they would always keep us safe. Slowly, at first, we watched as these things would shut down one by one, all citing the same issue: "The Rent is Too Damn High!" Some were just a symptom of poor business performance, but the ones that the whole neighborhood loved, were gone because there was no way they'd be able to make enough money to pay their rents without pricing out their loyal customers. Why were rents going up? Well it started with a man who had a big plan...you might know him by "The Donald" or simply Trump. The building I grew up in was the last one on 70th Street all the way west. 70th & Freedom Place. But that's no longer the case. Today it sits right next to a Trump building--a HUGE Trump building. For years the community board would battle The Donald, his hair, and his various investors. He was going to come right in and steal the views we'd enjoyed for many years, to lay out a strip of these ginormous condos. Not to mention what the implications would be to bring in these giant residences. Eventually an agreement was made that required him to build out the extension of Riverside Park in order for him to get the space. But as soon as he was looking into the space, things began to change. Buildings started going down and new bigger ones would come up in their place, all the while getting rid of the small businesses located on the ground floors. We got our first big multiplex in the area, which would have the 1st IMAX screen in NY and I think the 3rd in the world at the time. This was when things started changing. Some for the good and others not so much. One by one our favorite restaurants and stores would disappear, and we'd be upset about it, but a lot of them we could understand. As I said, a lot of the early ones were whole buildings that were changing. But once that slowed, it just became a matter of who could hold onto these fancy new spaces and their high-priced leases. But even as we watched and dealt with the changes of our neighborhood, some things we were pretty sure weren't going to go anywhere. They had history and a steady flow of customers. They weren't packed or anything, not always, but they had a good amount of business. Enough were the bartenders and servers were making a living wage. No one was complaining, and if they were it was just them being New Yorkers. The first of these old standbys to face the fate of many small businesses before them was the All State. You had to walk down a small flight of stairs to reach the bar and restaurant with old school charm and lots of woodwork. You'd think they were just another pub, by the look of the space and the (mostly) old bartenders that hung behind the front bar as soon as you walked in. But when you'd get the menu you would see that one page was written out as it was changed daily to offer you fresh and seasonal foods, while the other side was printed out with your typical pub fare. The quality of the food was surprisingly good. And for my household--especially my father and I, it was the old go-to when we couldn't decide where to have dinner or lunch. After pondering our options we'd just look at each other and almost simultaneously say "All State?" Old reliable. Until we got the news that the place we'd all at one point or another carved our names or thoughts into the tables was going to be closing. We heard it from our friend whose sister even worked there for a little while. Tragic we thought. What will happen to the bartender that's been there for decades and his following that visits him nightly for his stories and his booze? I guess they'll move over to P&G, another local watering hole with great drinks and service, but little to no good food that was just a couple blocks away. It was another Cheersy spot where everyone knew your name. 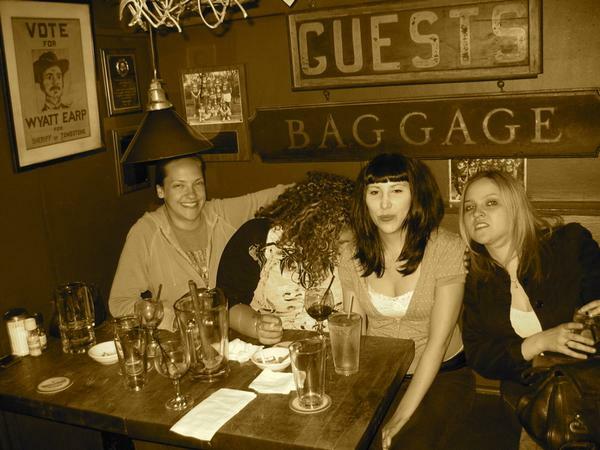 P&G, being strictly a bar scene, was definitely the place you'd go for cheap drinks and sufficient buybacks. You'd also go when you wanted to run into friends, because at some point in the evening, if they were going out in the area they'd likely stop in there. There were rumors before All State closed that one of the owners of P&G was trying to buy it, but that didn't work out and soon other places came and went in that space. But at least some of the staff found a new place to work at P&G for a shift or two, and the locals had a new watering hole. For there wouldn't be a reason that P&G would close, if anything we would think it'd get landmarked. One of the last remaining neon signed bars left in the city, it was a place where my mom used to hang out before she even met my father--back when she used to drink. And her daughters were carrying on the tradition with one another and our friends. 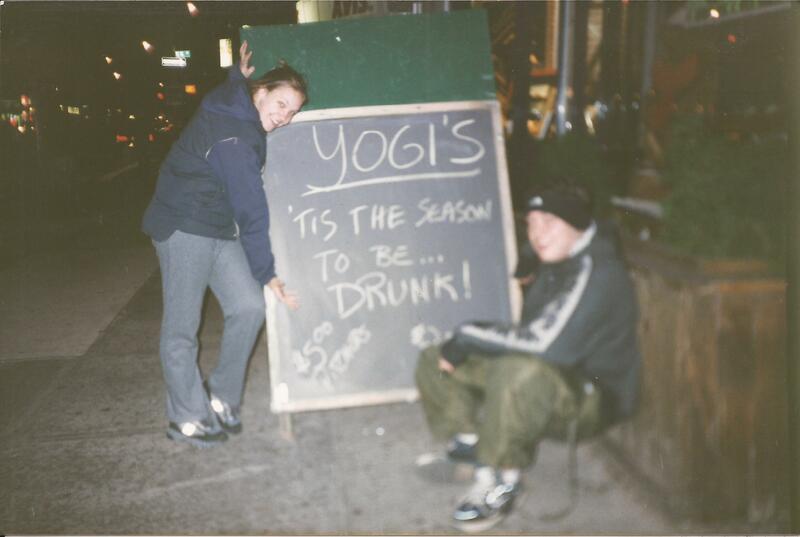 It was good enough of a hole that we kept going there even when we were of legal drinking age! ;) But soon they started posting notices and collecting signatures to keep P&G open. The community board began to change its tune about its feelings for a bar in that corner spot! But all of the history, we thought! There's no way you can shut this place down! There's Ratpack signatures in the basement! It was a mafia hangout at one point! Did I mention that signage?! We're talking a ton of TV shows and movies! We all signed the petitions, and got our friends to do the same, we sent out emails and begged and pleaded and hoped it wasn't really going to happen. But as you can infer from the tense I've used to describe it, it shut down. Guess the middles class don't need a place to drink anymore. And not just drink, but communicate with one another. These are places where you could go for hours upon hours and do that thing that people rarely do now...connect. Now that it's closed I suppose those regulars have found new spots, perhaps they frequent Malachy's, which for now, is still around. I guess with the pattern of these beloved dives closing you might wonder why the shuttered Big Nick's Burger Joint would be such a big deal. 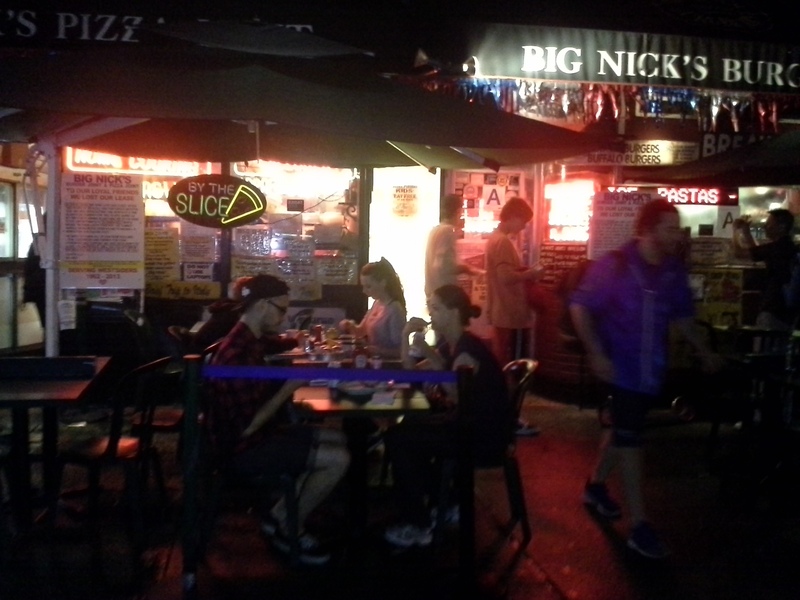 My first answer is that unlike the other places I mentioned, Big Nick's was always BUSY. It was open 23 hours, 7 days a week and it was always BUSY. Sometimes in the wee hours it was less busy, but there was never a lull. And if the restaurant itself wasn't full of people there would certainly be tons of deliveries going out. 23 hours, 7 days a week! Also it WAS the Upper West Side. Everyone went there--poor, rich and everything in between. You went for the full experience. For all of these reasons and more it was a place that we naively thought would be around forever. I know that I can say we because I've been commiserating with my fellow Upper West Siders for the last two and a half days since we found out. Yes, this was a place we went late at night or early in the morning with friends, but it was also a place where you'd go with your family. It was the epitome of a greasy spoon with a menu that lasted for days. And for a place that was a quarter of the size of most of your big chains, they would amaze you with the number of items that would fling out of their kitchens by the hour. It's a place that would get flack from one of those restaurant makeover reality shows because of all the things that we loved it for. They NEVER changed the decor, as I said--the menu was enormous and overwhelming, and the service was often pretty crappy. But the food was good, and you were never rushed to move along, even if you were just bullshitting over milkshakes. The walls were plastered with signs about specials on directions on how to properly pronounce the word Gyro. And then there were all the signs for the waitstaff to selectively ignore. Not only did I bond with friends and family there, but I took dates there. It was sort of a litmus test for me, and a place were I was safe. Once, the notoriously cold-shouldered waitress, who retired a couple years ago, was more into my date than I was. I had never seen her smile before until I brought this guy there. Of course it made me look like a liar as I'd warned him ahead of our arrival about the she-devil that we'd probably be served by. But this wasn't a reason to dislike the joint--we loved it. As my mom would say, it added character. And if we were too stoned to leave my friends couch we would find the phone and simply order a double-double, extra crispy, with cheese (two orders each of fries and onion rings covered in cheese and DEEP friend) for delivery...two blocks away. And although I haven't been there as often as I used to (mostly because I don't live in the hood any longer), it's always been a comfort to know that it was there. A place we could go after spending far too much on drinks in the area, we'd count on those burgers and gyros and cheese fries and pizzas to soak up all that alcohol. And we'd know that unless they were approaching cleaning hour, we wouldn't be pushed out. I'm sure that a lot of you out there have your hometown diners that you're equally attached to, but probably don't face the same threat of a shutdown if they're as successful as Big Nick's was, because the real estate is astronomical. And if you don't have a place like that, then I'm sorry for you. Nick, who's the owner of Big Nick's has said that they're looking into moving uptown--which would be great for me, as I live uptown, but of course it'll never be the same. I've also seen similar establishments like P&G attempt a location change only to be met by failure there as well. So I'm skeptic. I mean the thing about a neighborhood spot is that's it's just not the same if it's not in the neighborhood. Whatever the fate of Big Nick's is, I will treasure its existence forever in my mind and my soul. But, as with the passing of anything you have love for it will always sting that it's no longer there. Because these places that have so much history for me, for my friends, my family and my neighbors as well as the transplants aplenty that were touched by them, I may scoff at your suggestion to eat at Panera Bread, when there's a little luncheonette on the corner. So if you've ever wondered why I try to avoid those huge chains, it's because of events like the closing of Big Nick's that make it near impossible for me not to hate them. Without the money from their corporate offices, they wouldn't be able to afford the skyrocketing rents that push out the mom and pop shops that add character and charm and provide a landing spot to their neighbors. This is why we resist your Walmarts, IHOPS, Dennys, etc. We were perfectly happy with Big Nick's and Woolworth's, and now they're gone. So RIP to those we miss, and good luck to those that are still around. Remember the next time you're thinking of where to eat your next meal that it's not just a restaurant, it's a neighborhood spot, and if it's not--skip it! 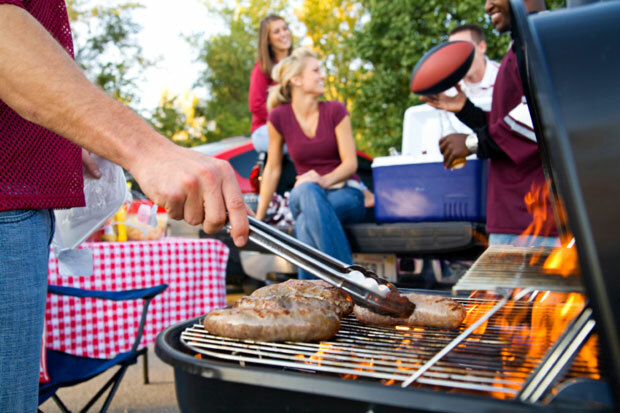 Break out the grill cuz it's Memorial Day Weekend! Or...if you'll be in NYC, forget that, because the NYPD & the FDNY don't take kindly to fire-escape grilling! So, if you're not escaping to the Hamptons on the new "Cannonball" train or even the time-tested Jitney, then see below for a plethora of ideas to partake in. The weather may not be perfect, but it's still better than winter, right?! Elastic City Spring Benefit will raise money for the arts with your tickets and donations, all while providing entertainment, cocktails, and dessert from Babycakes! There will also be a raffle and silent auction to include goodies from Shakespeare in the Park and pieces from some of the featured artists. 7:30pm. Brooklyn invades Manhattan with the opening of SmorgasBar at South Street Seaport! The people who bring you Smorgasburg and The Brooklyn Flea are now bringing some much-needed attention and and dough back to the badly hit Sandy vic. There's a long list of great Brooklyn reps that will be setting up shop and selling their wares for the benefit of all. Plus there's a couple new bars in the are that you should check out while you're there, like Watermark. BBQ alone, is so common, how about BBQ and hip-hop? Check out RUB-A-GRUB at the Do or Dine backyard in Brooklyn. Pre-sale tickets are out, but you can show up early and get your tix at the door! Performances will be headed up by the legendary Ali Shaheed Muhammad, from A Tribe Called Quest. And your food will be supplied by Food Network Star winning chef of Do or Dine. If I weren't busy with an Arrested Development Netflix-a-thon, I'd do this for sure! With a full weekend of classic mainland grilling, it might be easy to forget about our lonely island to our west, you know, Hawaii. But Andrew Carmellini's hotspot The Dutch is taking it tropical by offering a Memorial Day Luau at the restaurant from 12pm to 9pm. There will be a prix-fixe lunch until 5pm and a family style dinner from 5-9pm. Classic Hawaiin dishes will include suckling pig and tuna poke. This might be a rare chance to step inside the place without a forever-long wait! Aloha!